Paper 2: for Architecture and Planning programs. If you are desirous of pursuing B. Arch. in IIT Kharagpur or IIT Roorkee, you must clear the Architecture Aptitude Test (AAT). The contenders who have secured a rank in JEE (Advanced) are eligible to sit for AAT. The test will be be held only at the seven zonal IITs. This means, in order to get a B. Arch course in these two institutions, one has to clear Paper 1(B. Arch. / B. Planning.) of JEE Main, JEE Advanced and AAT. For admissions to institutions other than the IITs, JEE Main Paper 2(B. Arch. / B. Planning) scores are taken into account. Paper 2 can be attempted by pen and paper only. B. Arch is a 3 hours exam based on Mathematics, Aptitude and a Drawing/Sketching Test. The aptitude test can be written only in English language. You must carry your own colouring and drawing aids. Paper 1 can be attempted in both online and offline mode, whereas,paper 2 can be attempted by pen and paper only. 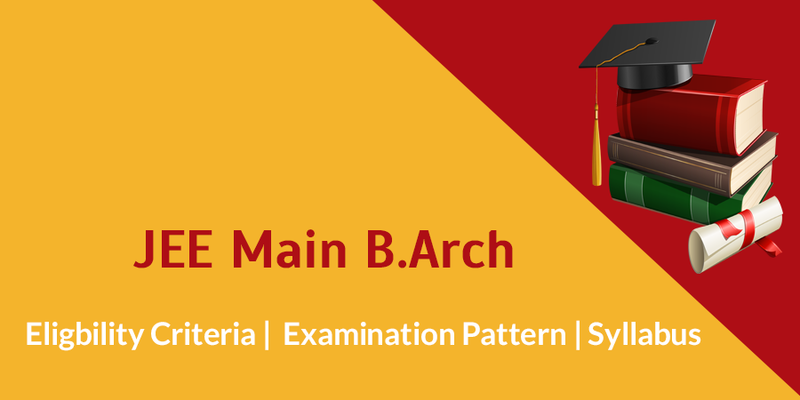 The complete B arch syllabus for JEE Mains and AAT. 1. Maths: Relations and Functions; Sets, Complex Numbers, Matrices and Determinants; Quadratic Equations; Permutations and Combinations; Sequences and Series, Induction, Simple Applications of Binomial Theorem, Integral Calculus, Limit and Continuity, Differentiability, Differential Equation, Co-ordinate Geometry; Vector Algebra, Three Dimensional Geometry; Trigonometry, Statistics and Probability and Mathematical Reasoning. 2. Aptitude Test: Texture related Architecture, Awareness of build-environment, materials, objects, 3D objects visualizing from 2 D drawings, 3D objects visualization, mental ability and analytical reasoning. 3. Drawing Test: 3 D observation, building elements and forms, colour texture, contrast and harmony, Drawing and Design of abstract or geometrical patterns and shapes in pencil, elevations and 3D views of objects, creating 2 D and 3 D compositions using given shapes and sketching of activities and scenes. The best approach to prepare for the exam will be to combine your boards’ preparation with JEE Main paper 2 preparations, though the format may differ but the concepts remain the same. Instead of learning by rote, focus on understanding the concept before moving on to the next topic. Refer to both Class XI and XII books for Maths especially. Divide your syllabus in monthly and weekly segments and assign practical targets to achieve them. Work on your observation skills and drawing to prepare for the Aptitude and Drawing tests. You may join a coaching class for drawing practice. Utilize your Engineering Drawing notes for 2D/3D questions’ preparation. Clear your doubt at the earliest to avoid any confusion later. Try to add variation in your daily study schedule, like study Maths, Drawing and Aptitude related topics, to avoid monotony. Make revision notes/flash cards on concepts, formulae, definitions etc. for each topic. Solve enough sample papers and previous years’ tests to develop pace and practice. You can even take online mock tests for practice.